Advanced Pen Making Kit-less construction; designs and challenges beyond those normally associated with kit pens. 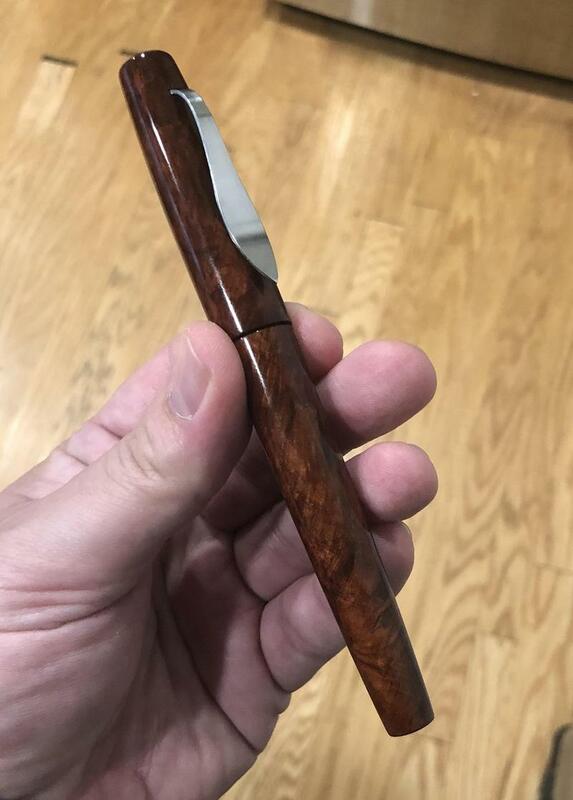 I’ve started making my first kit-less fountain pen and I want to try my hand at making the clip. I’m down to making the clip and instead of altering an existing one I want to start with making my own. My question is what thickness of metal should I use? Does it depend on the material? I am currently in the same boat. I don't think I've got the material or method down pat 100%, but the material and the tools at your disposal are big determining factors. A lot of clip makes I've seen use either nickel silver or brass. They are relatively soft and therefore must be thicker to avoid getting bent. Steel is stronger, but also makes it more difficult to finesse into the size/shape you want. It still may also be susceptible to getting bent without certain a certain variety of steel and hardening procedures. Not perfect, but I'm getting there. I ordered some samples of nickel silver to try and we'll see how that goes. I would start with 1/16. I believe that Mike Redburn has mentioned that thickness in the past. I have used it for bronze based on John Albert's recommendation and I believe that's what he uses for bronze and nickel silver. If it's too thick you can always file it down; if it's not thick enough, you're sunk. I make mine out of large stainless hose clamps. The stainless strap is about 0.7-0.8mm thick. This works for me. I made one out of 0.042” (1.07mm) titanium. I had to heat it to get the 90deg bend at the top and clip end. I then bead blasted it for the matte finish, Ti also polishes real nice. All very nice! How do you folks fasten them so they hold firm please? Integrating a clip is the hardest part of cap design. I used a socket cap bolt and machined a groove to capture my clip. Thank you. That's outside of my league. Well done! I just ordered some 510 Bronz at .04 and .09, Nickel-Silver at .06 and SS-301 full Hard at .050”. I also ordered some silversolder to try my hand at that type of connection. This guy is really interesting and when disaster strikes, you see it. Some of his Toastmaster speeches are also quite humorous. He also has videos on making a mandrel on a wood lathe and making a kitless pen on a wood lathe. He's not slick, but you can learn a lot. If you have a clip with a large enough OD you can leave the it exposed and a bit proud. Just make sure that the male thread of your finial is a very close fit to the ID of the clip to keep it fro moving around. Screw it down tight and use some sort of thread locker/sealant to keep it from coming unscrewed. DAMHIK!